Ain’t nothin’ wrong with flaunting it. Your geekiness, I mean. What did you think I was talking about? 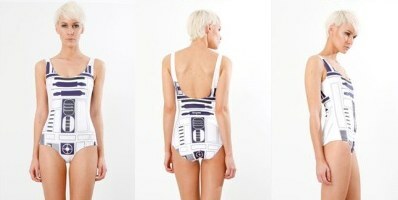 This R2-D2 swimsuit is the usual Lycra construction, with UV-blocking fibers and all that other stuff that’s in pretty much every swimsuit now. It costs $85 over at Black Milk Clothing. I don’t know if that’s a lot or not. What do girls pay for their swimsuits? I don’t even know where my swimsuit is. There will be a 2-3 week delay if you order it, because geek is the new black.